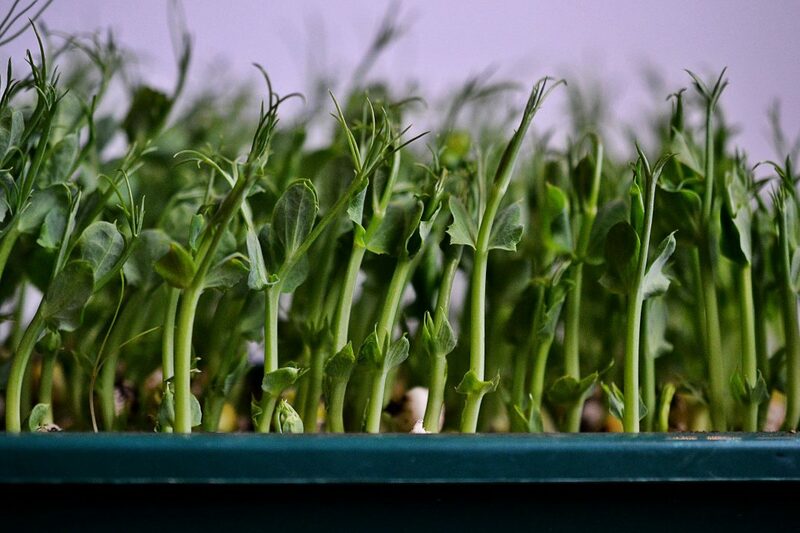 Lovely pea sprouts in different stages, some are ready to be harvested. I usually grow my pea sprouts in big trays and troughs that I completely fill up. Recently I’ve seen a lot of pictures online showing pea sprouts in tiny little bowls and pots, which got me curious. Just how long would that harvest last? Is growing that little worthwhile? Sure, I do see the esthetic value of a beautiful small pot overflowing with proud green pea sprouts, but if all of that fixing doesn’t give any real return I hope this entry about the opposite approach may be beneficial. Although the actual method for growing them is identical. I tested growing some in a smaller trough, about twenty by fifteen centimeters. We harvested our first sprouts for yesterdays lunch and come breakfast today, we were all out. The kids have definitely eaten most of them and I really don’t blame them. The tender little sprouts smell and taste so good that it’s really hard not to keep snacking on them once you’ve started. So, our harvest didn’t even last 24 hours. That makes for a whole lot of little pots to keep after to get any return for a family with a couple of kids. I need to think bigger. And quite possibly, so do you. 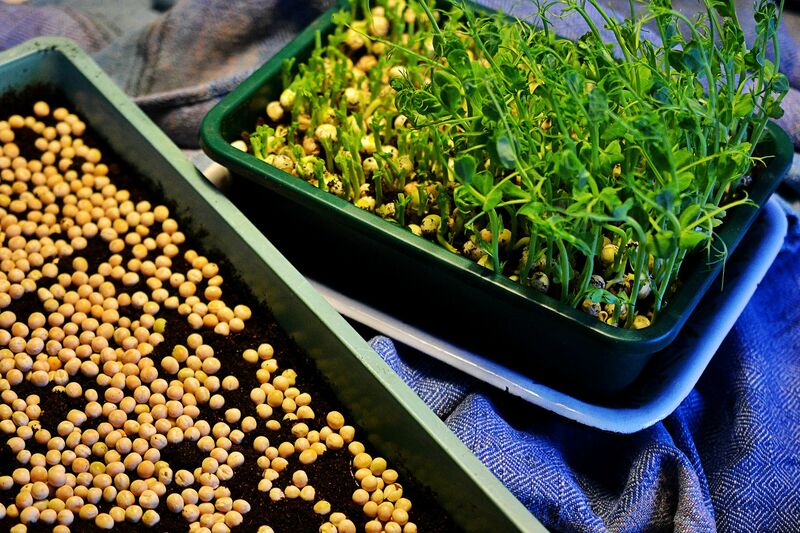 Pea sprouts can be grown indoors without any extra light source - your only limitation is space. I’m fortunate to have extra deep window sills in some of my windows, and these I gladly fill with pea sprouts. These accommodate bigger troughs, trays really, several in rows. A smaller pea sprout factory like this can make a difference in your household economy, or at least more so than the odd pot. With an even and rather large harvest we don't need store-bought cucumbers for putting on sandwiches. A win-win situation for my wallet and the environment. Our kids really enjoy the sprouts and when we have some ready for harvest, they’ll have both one and two sandwiches with only pea sprouts and some chili salt on top. If there’s plenty we’ll gladly put a big pile of them on top of an omelet or in a salad with shredded carrots. A dense carpet of pea sprouts at their finest. Under 4 inches (10 cm), chubby and totally snackable. 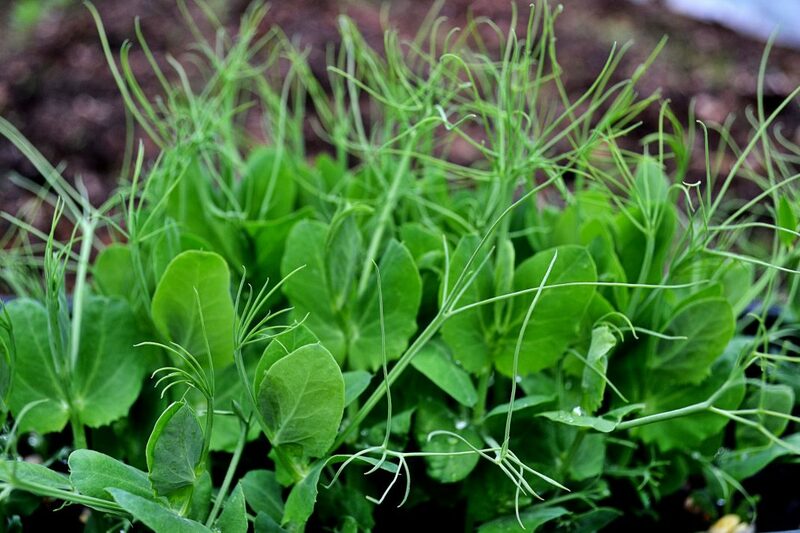 Pea sprouts need about a week from planting to harvest, within 8-10 days you can start cutting them down. They are tastiest when they’re under 4 inches (10 cm), chubby with a thick foliage. Always make sure to leave about 0,75 inches (2 cm) above the peas to let them regerminate and shoot new shoots. Chose a big through that still fits on your window sill, or on a table just next to a window. It could be a kitchen tray, a planter, a balcony flower box or a shallow crate. If the bottom has drainage holes in it you’ll need another trough under it. Fill up your trough or tray with a thin layer of soil, three quarters of an inch (2 cm) will be plenty. Now sprinkle your soil with an even layer of yellow peas, regular yellow peas that can be bought in any grocery store, as many as you can fit. 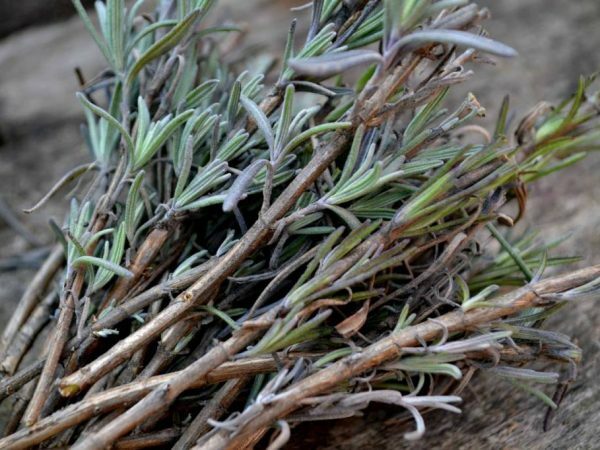 Pat them down a little and water them, but make sure not to soak them. As the peas start to germinate they’ll need a lot of water, they swell up, so make sure to keep an eye on them. You don’t need to cover them with soil. Pea sprouts are fast growers even in the vegetable garden. These were put in the ground in June for a quick harvest before I plant my fall vegetables. 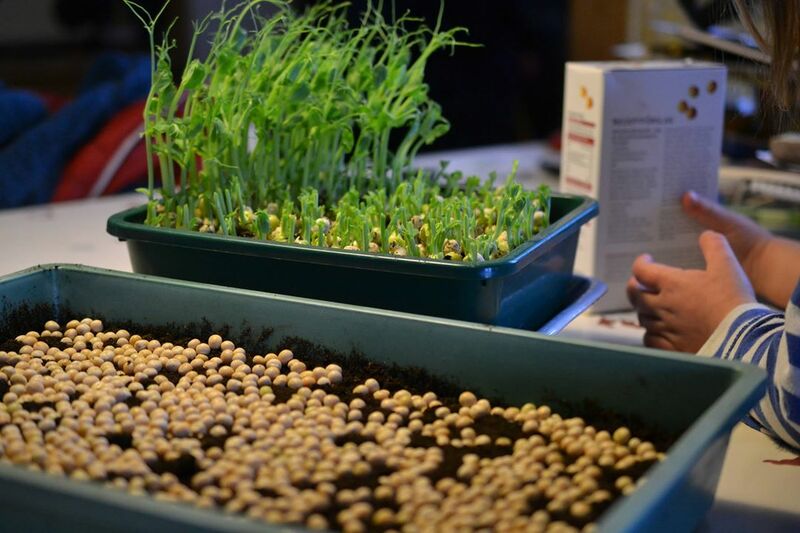 Remember that peas, just like cress, will grow well in both cold frames and hot benches as well as in the ground, just like any other vegetable. If you have a hot bench they are especially good for placing in between tight rows of other crops since they will be ready for harvest before most other vegetables will have even started germinating. 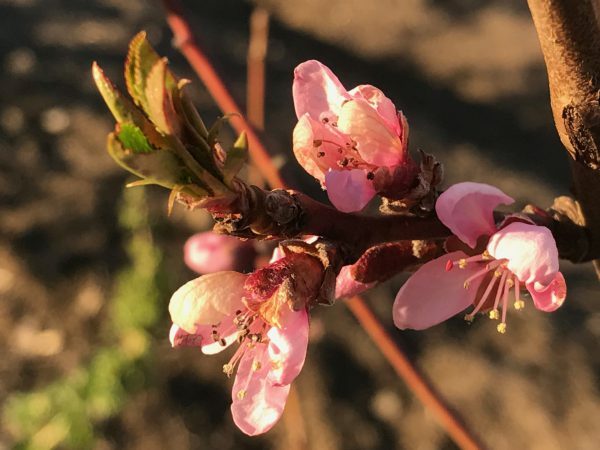 If you grow them under a fiber cloth in a green house you can start them early in the season or grow them late in the season when all other crops have been harvested. If you have planting boxes outside in the open that you don’t quite know what to do with yet, growing a first round of peas is easy and effortless. A couple of weeks ago I thought I would need pea sprouts for a photo shoot (that was later canceled) and bought a packet of them in the store. 3,5 ounzes (100 grams) of Swedish organically grown pea sprouts (where I had to cut off about 2 inches, 5 cm, that was too tough) set me back 3 USD (25 kronor). Just to compare, a carton of 17,6 ounzes (500 grams) of dried organic yellow peas is only 1,44 USD (12 kronor). 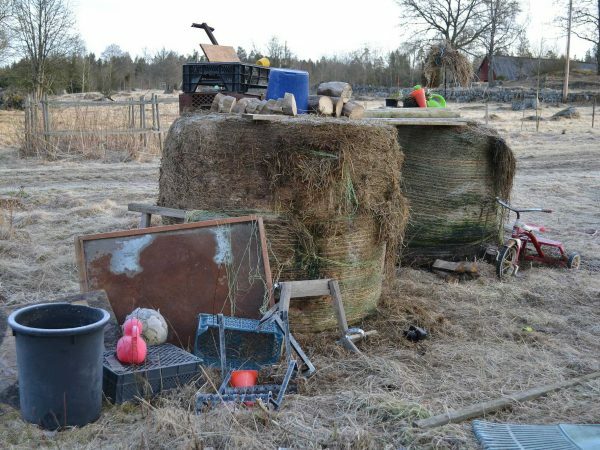 That makes for a price difference of 12,32 USD/lb (226 kronor per kilo). Or actually, you should triple that as I get three harvests out of every round of sowing. More pea sprouts for the people!